The WSCC Library in Angmering may be found on Church Hill, Arundel Road, opposite St Margaret's Church in the centre of the village. This attractive building was originally the village school and was constructed in 1844, reconstructed in 1853, and a new eastern wing added in 1884. (see Schools history). 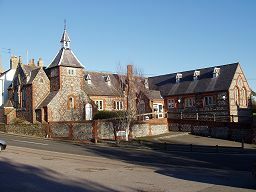 In 1966 the school moved to a new location in Arundel Road and, after 8 years of uncertainty, the building was purchased by West Sussex County Council in 1974 for conversion into a library. The Children and Family Centre operates from the same building. On Saturday afternoons, the Library is open and is run by the Angmering Parish Council Community Library. - Borrowing Section for books (incl. large print), spoken word disks, & DVDs.